A lymphangiogram is an uncommon procedure that can be performed by interventional radiologists, typically to identify and potentially treat the source of a chylous leak. Surgical management (direct fix of the leak intraoperatively if visualized) and medical management should be optimized first. Specifically, the patient should be on a low fat / medium chain triglyceride diet. Long chain triglycerides are absorbed by the lymphatics, which leads to extra lymph production. Medium chain triglycerides however are absorbed by the portal veins, reducing the production of lymph. Spinal cord masses can be confusing at times, especially if not encountered routinely. While it may be difficult to arrive at a specific diagnosis, a narrowed differential can often be very helpful to the referring clinician. Clinical history is also quite useful at narrowing the differential. The first question to ask is where exactly is the tumor located within the spinal canal. 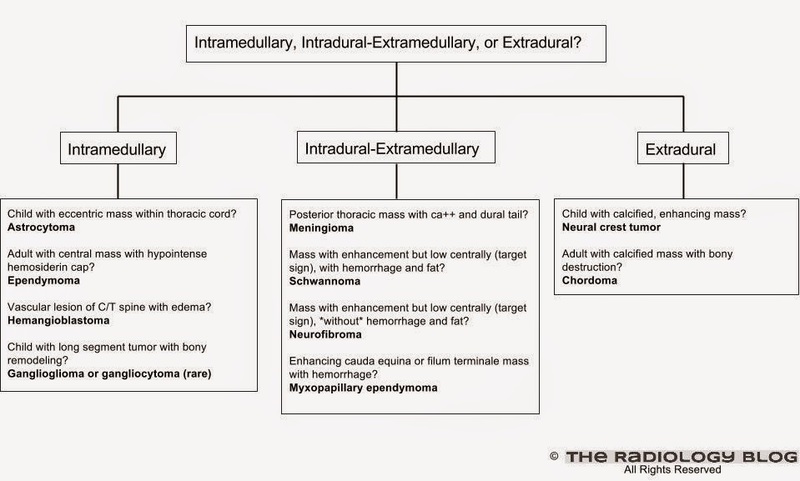 The broad categories are: intramedullary, intradural-extramedullary, and extradural. An intramedullary mass will be centered within the substance of the spinal cord itself, which has been described as the claw sign. An intradural-extramedullary mass will form a meniscus with the cord and push it away. An extradural mass will be outside the thecal sac. Vertebral body or clear epidural involvement suggests an extradural location. In cases where the distinction is difficult, assess the cord above and below the mass. The chart is not comprehensive, but it does list the most common primary masses to be found within those locations within the spine. As always, metastases are a consideration in any of these locations. Making the distinction can be challenging at times, especially when the mass is large and distorts normal structures. A common finding in patients with abdominal pain is dilated loops of small bowel. Dilated loops may be noted on plain X-ray, fluoroscopic studies, or CT. The first step to forming a focused differential diagnosis is determining whether the folds are thin, thick (> 3 mm), or thick and nodular. If there is segmental thickening of the folds, think of the three Is: ischemia, infection, or idiopathic. Diffuse fold thickening is usually due to systemic processes such as venous congestion or cirrhosis. Nodular fold thickening is usually due to infiltrative processes of the bowel wall. Common etiologies include Crohn disease, infection, lymphoma, metastases, and Whipple disease. 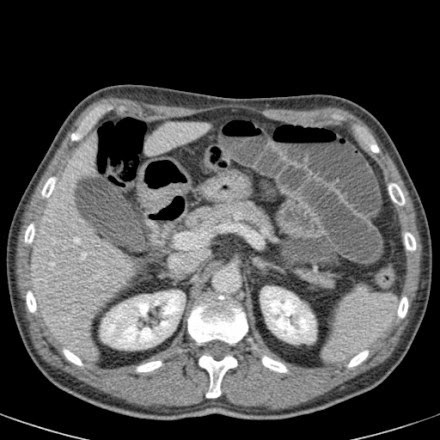 If the dilatation is thick walled, check out the differential diagnosis for small bowel aneurysmal dilatation.